Steve Kinniburgh wants the same again from Corby Town tonight (Tuesday) as they bid to move into second place in Evo-Stik League South Division One Central. The Steelmen head to Welwyn Garden City knowing another victory will see them leapfrog Bromsgrove Sporting into second spot and also close the gap on leaders Peterborough Sports to two points. 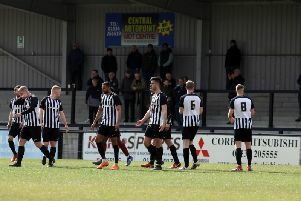 Corby go into the re-arranged clash on the back of a six-match unbeaten run with five of those bringing wins, including the 4-1 success at Aylesbury on Saturday in which Elliot Sandy hit a hat-trick to take over at the top of the division’s goalscoring chart. The clash will be the Steelmen’s third away game in a row and boss Kinniburgh wants to see the same attitude from his players. “We have got 16 games left, we tick another one off tonight and as long as we keep doing the right things and keep battling, working hard and creating chances then there won’t be any complaints from here,” the Corby manager said. “We have had quite a few away games over the last few weeks and it will be three in a row tonight. Then we are back at home but then we have another away game the following week. “We have to make sure we prepare properly because when we go away from home, we aren’t turning up to Steel Park, we aren’t turning up to a place that looks like that. The Steelmen welcomed Joel Carta back from injury at the weekend but Miles Smith was still missing with a thigh problem.